You know that glorious feeling when you get the whole house to yourself? Well, how about an entire village? If you’ve ever lived in Edinburgh during the Fringe, you’ve probably felt the urge to go somewhere…uninhabited. Well, here’s your chance! This adorably tiny village on the Isle of Skye has just gone up for grabs according to the Independent, for the low low price of £1.25 million. An absolute bargain! Get away from everyone who’s ever annoyed you by becoming the brand new owner of Mary’s Cottages – a village of your very own. You’ll be getting a five bedroom house, along with four thatched cottages, and a very generously proportioned shed. 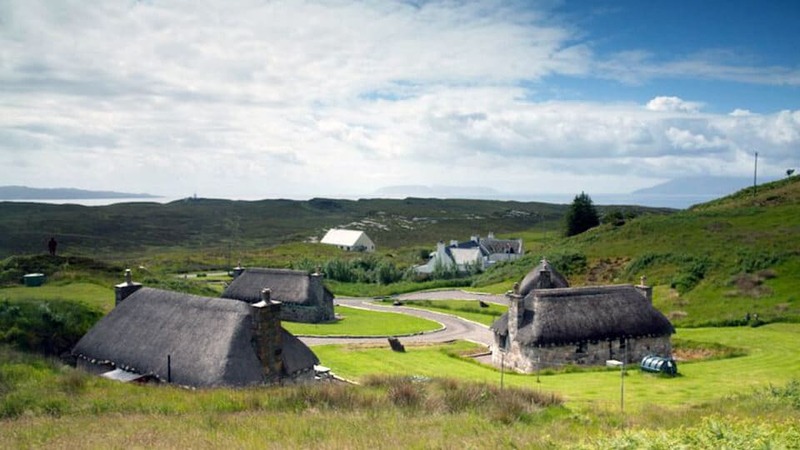 While the cottages are traditional Scottish blackhouses (two restored from ruins and two newly built), the main house is decorated in a contemporary style. Located in Engol, which is a small fishing village close to Loch Coruisk, Mary’s Cottages are currently being run as a self-catering holiday destination for those seeking the peace and quiet of the infamous Highlands. The nearby Loch is fabled to play host to a kelpie (shape-shifting water spirit), and the idyllic views of the region provide the perfect backdrop for a cosy break – temporary or permanent. You can continue running the cottages as a business enterprise, or you could grab your closest pals, and set up your very own kingdom*. In all seriousness, whether you’re interested in this opportunity or something a little more… ah, populated, get in touch. We’ll set you on the right track to owning your own home/castle/village, wherever you are in the UK.